Professor Vincent Wade (Director, ADAPT), Professor Linda Doyle (Director, CONNECT), and Professor Michael Morris (Director, AMBER). 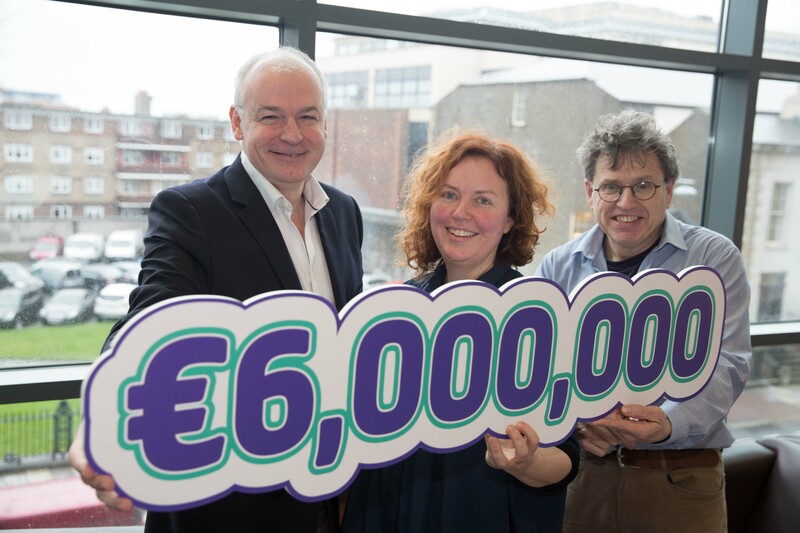 CONNECT is to lead a new postdoctoral programme, Edge, with two other Science Foundation Ireland research centres led out of Trinity College Dublin – ADAPT and AMBER. The programme is to receive €6 million in Horizon 2020 EU funding and will employ 71 world-class ICT researchers. It is the single biggest award for Trinity College Dublin under Horizon 2020, the EU’s €80 billion research and innovation funding programme. The award, made under the EU’s COFUND initiative, will match €7m of funding already pledged to the EDGE project by the three centres. EDGE will be coordinated by Professor Linda Doyle, Director of the CONNECT Centre for Future Networks and Communications, headquartered at Trinity. “This programme will attract more leading ICT researchers to Ireland’s third level institutes,” according to Professor Doyle. “EDGE will support research at the interface of three strategically important areas of ICT: advanced materials, telecommunications networks and digital content technology. Expertise in these fields is particularly attractive to employers and EDGE will strengthen Ireland’s ability to create and attract high quality jobs. “Industry, in particular, will play a major role by providing secondment opportunities and specialised training to EDGE Fellows. The three participating research centres have unrivalled access to industrial partnerships and already work closely with more than 70 companies. EDGE will consolidate Ireland’s ‘knowledge triangle’, linking higher education, research innovation and industry. EDGE will run for five years with recruitment of postdoctoral researchers commencing in September 2016. Ten third-level institutes around the country are participating in the programme which will be coordinated by the CONNECT Centre at Trinity College. ADAPT focuses on how to get the most from digital content through extracting meaning from global content streams, personalising content delivery and improving user interaction with the data stream. AMBER (Advanced Materials and BioEngineering Research) is focused on advanced materials research that will enable the development of nanoscale electronic devices with better functionality for sensors, data processing and memory applications, enabling next-generation consumer and business electronics. CONNECT designs flexible and responsive telecommunications networks with a strong focus on Internet-of-Things. The EDGE project is funded under the European Horizon 2020 Marie Skłodowska-Curie Actions (MSCA): Co-funding of Regional, National and International Programmes (COFUND) Fellowship Programme scheme.